The Peter A. Fabrizio, Jr. 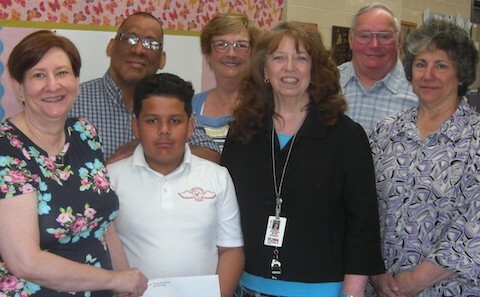 Scholarship Fund, in the amount of $500, was established in 2003 and is given to a Rome Catholic School third grader who holds the highest grade average at the end of May. Peter died in a tragic auto accident in 2002 and, at the request of his parents, the Foundation is administering the scholarship. Rome Catholic School announced that Cooper Goetz is the recipient of the 2018 Peter Fabrizio Scholarship. Last year's Foundation President, Pamela Havens, is shown presenting him with the $500 award. Next to Cooper is RCS former Principal Patty Bliss and Cooper's third grade teacher, Barbara Swistak. In the back row is his father, Edward Cirilo, his grandmother, Kathy Goetz, and his grandfather, Charley Goetz.